You’re probably familiar with the general shape of our Milky Way galaxy, that is, a circular disk of stars with a thicker bulge in the center. While that is a good description of the overall shape, there is actually some interesting structure within the center of our galaxy. This past Fall the first detailed 3D map of the central bulge of the Milky Way. The results were published in the Monthly Notices of the Royal Astronomical Society or MNRAS (paywalled, but arxived here). The authors created their map by looking for bright red giant stars at infrared wavelengths. You might remember a few days ago I mentioned how a method called TRGB (Tip of the Red Giant Branch) that could be used to test the accuracy of Cepheid variable stars. This method is useful because these bright red giants have a fairly uniform brightness (absolute magnitude) so by observing their apparent brightness at infrared wavelengths we can determine their distance. Near the central region of our galaxy there are lots of these stars, so a survey of the region provides a good measure of the distribution of stars near the center of our galaxy. The team used data from the Vista Variables in the Via Lactea (VVV) infrared survey, which has been mapping the central region of our galaxy since 2010. What they found was that central bulge of our galaxy is not shaped like a simple oval, but rather has a kind of peanut shape. 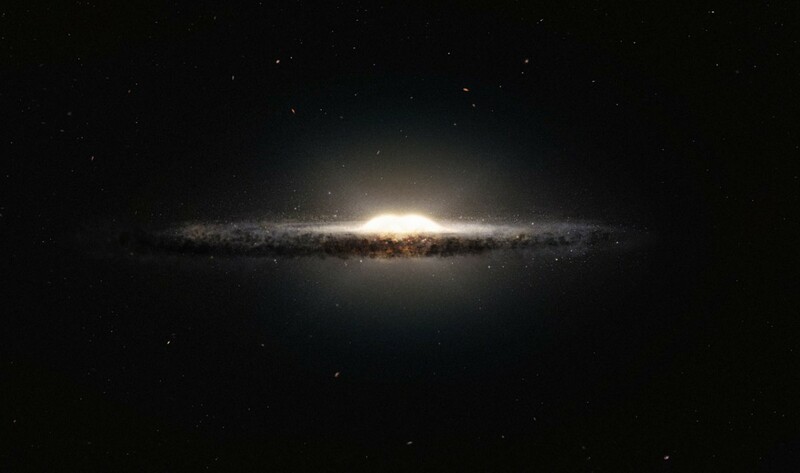 You can get an idea of the shape in the artist rendering of our galaxy seen below. What’s particularly interesting about this is that it implies that stars in the central bulge are not moving in simple circular paths. While that might seem odd, it isn’t entirely unexpected. For stars in the disk of our galaxy, most of the mass concentrated at the center, much like the Sun is at the center of our solar system. So those stars have fairly circular paths. But for stars actually in the central bulge, the mass of the galaxy is all around them. So their orbits are more strongly affected by the distribution of other stars around them. This month another paper was published in MNRAS (again, arxiv to the rescue) which ran computer simulations of the central bulge to see what type of stellar motion could give rise to a peanut-shaped central bulge. What they found in their simulations is that stars in the central region can gradually develop a peanut or figure-8 shaped orbit. This is due to a resonance between the stars and the overall gravity of the galactic plane. Of course this is just a computer simulation, but it makes a very clear prediction. If such a resonance does drive the peanut shape of our central bulge, then the stars within the bulge should have speeds perpendicular to the galactic plane that are much higher than stars outside the bulge. We can put this to the test when we get data from the Gaia spacecraft, which is set to launch later this month. Paper 1: Wegg C, Gerhard O. Mapping the three-dimensional density of the Galactic bulge with VVV red clump stars. Monthly Notices of the Royal Astronomical Society. 435(3):1874-1887. Paper 2: Quillen AC, Minchev I, Sharma S, Qin Y, Di Matteo P. A vertical resonance heating model for X- or peanut-shaped galactic bulges. Monthly Notices of the Royal Astronomical Society. I’ve found them to be less peanut-shaped and more X-shaped. The illustration for this article has greatly emphasized the peanut bulge and minimized the associated X. Presumably the X is just a couple of cones viewed edgewise. On second thought, the shape is probably more complicated than cones in many cases, if not all. I take that presumption back. I’ve seen a lot of X’s in edgewise galaxies, though!